Warning: This page swings between nostalgic to geeky and it will be very boring to most of you. So please DO NOT READ it unless you really…I mean REALLY want to! I have been lucky enough to be able to witness a few incredible revolutions: the advent of the internet is a massive one (can you imagine a world without it? That was the reality in which all the following events happened), but before this there has been another big one: the moment when computers entered the households. This for many of the kids of my generations meant a shift in the way they entertained themselves. However for a few of us it meant dreaming about becoming superstars creating (or hacking) video-games! It all started when I was only 8 and my father bought his first computer consisting in a chunky gray keyboard named Commodore 64, with a few peripherals: a green monochrome monitor, a tape device, a floppy disk drive and a very noisy dot matrix printer. He invested two months of his salary believing to bring home an ultra-modern mix between his old Olivetti type writer and a powerful calculator to make his job easier, increasing his productivity. No need to say that I saw a very different potential in that mysterious box: colours (although the monitor was only showing shades of green!) and sounds to create some sort of emotional response in the people around me. I was blown away and I used every moment in which he wasn’t at the computer to create “stuff” with it. At that time there were very limited applications available and the only way I had to create little games and presentations was to program them. After a while the pages of the instruction manual were so worn out that they started falling apart, but I was growing quite proficient at programming in Basic. Unfortunately, my lack of maturity was such that I always reached the limit of the memory available (only 20K!) with the animated introduction alone, not leaving enough memory for the real game. In retrospect I now understand that I wasn’t really interested in providing an interactive experience. I just wanted to “amaze” with colours (yeah…I know! ), sounds and this is almost funny when I now think about the visual and audio capability of that crude technology. The whole thing is even funnier when I realize how desperate I was to impress my family and the only reaction I could get was a mixture of underwhelming, condescending, worried, puzzled faces. At that time a computer was something quite esoteric and although my father grasped that this was the future no one could imagine how widely spread and crucial they would have become. So I really can’t blame them for not fully understand my fascination. Anyway, my determination was such that I’ve finally managed to amaze someone, when I showed a multimedia presentation at the exam that brings the Italian pupils from the secondary school to the next step in their academic path (in my case the high school). It might sound a bit pretentious but it was 1990 and I truly believe that this was the first time my professors saw such a thing. In fact one of them waited the end of the presentation, to ask for the computer to be switched off and then she said, with a slightly obnoxious tone : “OK, let’s now see if you actually know all the things you’ve showed so far”. Anyway, it turned out that I knew how to answer the questions my teachers posed me even without “the help of the computer” and in the end I did score top votes. 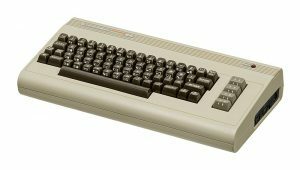 Perhaps, this helped convincing my father to buy me a shiny new toy…a beautifully looking Commodore Amiga 500 expanded to a grand total of 1Mb of Ram! If you are wondering, the answer is: Yes, after a while I’ve also managed to get hold of a colour monitor too. So with that “incredibly powerful” setup I started my “career”…thanks dad! Each one of us looking back at our story can clearly see how some events influenced everything that followed. One of those nodal points in my professional life was meeting with Emanuele Viola, a very tall, curly, pale and skinny guy that always wore black clothes…and (as it turned out) a genius! I just started the high-school and since our worn out desks were designed to accommodate two people he was forced to be my new neighbour. He did his best to clearly show no interest whatsoever in any kind of social interactions, but I was quite determined to get to know more about what seemed to be a quite clever and characterful teenager. 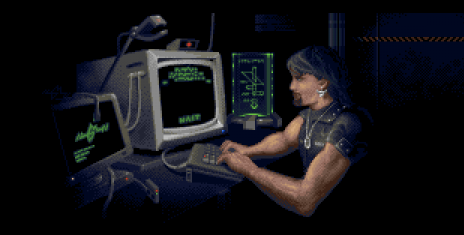 Soon enough I’ve discovered that he had an Amiga 1000 and he was teaching himself how to program. Long story short, after a few months we’ve joined forces to build an incredibly simple game…and another one…and another one, gradually increasing the complexity, gaining confidence on what we could build together. Since the very beginning we split responsibilities: I would take care of the artistic aspects and he would focus on the technical side. 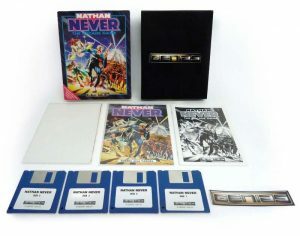 Luckily enough, ‘Sergio Bonelli Editore’ -one of the main Italian comic book publishers- was about to launch Nathan Never, a new sci-fi comic and a software house bought the rights to make a game out of it. A friend of Emanuele knew Marco Filippini, the musician involved with the project and so he arranged a meeting for the three of us to talk. We were only 15 with no real experience in game making. It was hard to believe in such young kids. So, he asked us to make a demo and he kindly made himself available to show it to the CEO of the software house. After two weeks of secret, nocturnal, tireless work we had a fully explorable level and we managed to win the job! I took care of all the graphics, the backgrounds and the character animations, “painting” them frame by frame, pixel by pixel, whilst Emanuele was coding in assembler every single routine in the game. We did follow the requests and direction of Roberto Genovesi the game designer chosen by the ‘Sergio Bonelli Editore‘, but all the development work was done by us in our bedrooms, mostly at night, with no technical support from the publisher. In the morning at school I was bringing the disks containing the updates to Emanuele which was importing the graphics. Once or twice a week I was swinging by his parents’ flat to comment on how the sprites were implemented and then we would make the necessary tweaks. At that time I was obsessed with Psygnosis, a Liverpool based publisher which had a great style and produced games which were -and to some extent still are- considered revolutionary pieces of digital art. My admiration for these developers/artists was so big that I couldn’t resist the urge to introduce a reference to a couple of their games…I’m glad I’ve done it, but now I deeply regret to not have included Agony in these screens…Oh God, how much I’ve loved Franck Sauer‘s style and these loading screens, with that super atmospheric music…They’ve haunted me for years! 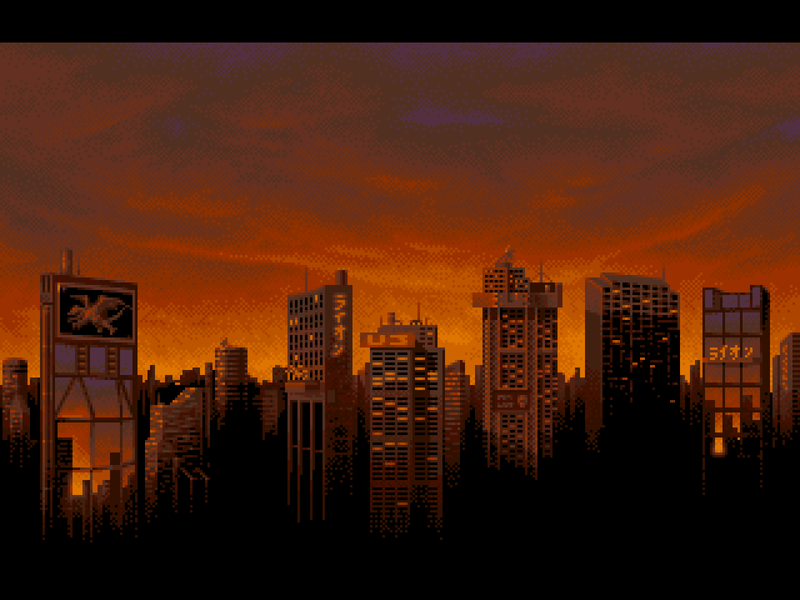 Most of Psygnosis games had animated intros. So, in order to make our game a bit more special we asked Stefano Aquino, an award winning 3D artist and most importantly a good friend of ours, to create some rendered content with Turbo Silver, one of the first ray tracing software available for Amiga. This short video was contained in a fourth disk only available in a limited edition. A few months later the game was released in an official event at a well known comic book store, where we signed the first hundred copies in front of queuing Nathan Never fans. I can now candidly admit that unfortunately we didn’t have enough time to complete everything as it should have been and our inexperience really showed up in some bad choices we made which privileged the visuals rather than the interactivity and…the players’ FUN! It might sound crazy nowadays, but at that time we didn’t know how badly we needed beta testers to comment and criticise, telling us their feelings and opinions about the game. Anyway, the whole journey of making and presenting a real professional game was just the most intense and exciting experience I had until then and being in front of that crowd willing to buy our game made us feel rock stars for one evening. So, there was (almost) nothing I wanted more than do it all over again! Nathan Never the arcade game // Amiga screen shots. If I remember correctly at the end of Nathan Never both Emanuele and myself were quite exhausted. We had to pull out our first game in about six months, but because during the working days we had to go to school, that required working week-ends and most nights. Neither of us had been paid the full (and yet very small) amount agreed on the contract, but since I was done with my job a few weeks before him, I was spared from receiving the threatening phone calls of the publisher. So, in a way I had it easier. That first experience was far from perfect but the thrill of creating something from scratch made me believe that we had to try again, this time changing a few things. Emanuele was very reluctant or at least more cautious than I was. One day we’ve decided to go watch Akira, since it was finally landing on a few Italian theatres. Some aspects of that film left me puzzled, but I did love the motorbike! I do remember clearly that leaving the Cinema I’ve mentioned how cool it would have been to create a racing game with that bike in it. That’s where our second game endeavour started! Emanuele wasn’t convinced, perhaps he was burned out and the last thing he wanted was to go through another painful experience. So, I had to rise the bar a bit and sell him a vision he couldn’t resist. Since I knew way too well how big of a fan of “Fist of the North Star” he was, I pictured him a similar setting, mixed with another couple of references we both liked. It was all discussed on a noisy bus on our way back to our parents’ flats, with me trying to convince him to believe in this new adventure. He didn’t show any form of enthusiasm at first, but then I did manage to get him somehow interested in, at least, a first technical investigation. 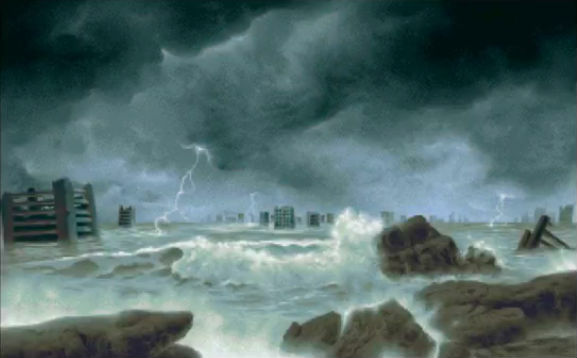 Whilst he was working on the street rendering routine I’ve decided to do some research on the mood and I sketched a few images that would depict the world before and after the nuclear explosions. These very same images became the title screen and the first shots of the intro. Once Emanuele got back to me about his progress he already had a nice and fast looking racing track rendered very smoothly at 50 fps. As a next step, we discussed how to split the colour palette amongst all the elements to put on screen during the race and I’ve agreed to use only 4 colours (2 bit-planes) for the far background (this was already the case for the road), with the condition of being able to change this palette every two lines. This little trick allowed me to create some pretty nice and colourful backgrounds, which were light enough to be animated…and they had parallax too! I’m quite proud of that as it was a bit of a challenge to create graphics in this way. We would then use quite a few colours for the sprites which would render the interface at the top of the screen, as well as the weather effects and the motorbike. Unfortunately only a bunch of colours were left for the enemies and the props on the street, including the explosions, which was far from ideal, but on the other hand it made sense to go for a brownish muted palette to represent these elements, given the post apocalyptic settings. Moreover, by the time Emanuele had all the graphics and sound running the frame rate dropped to 25 fps, which was a bit of a shocking defeat considering that we were aiming for a super fast and fluid game. It required time for both of us to process, deal and accept this. 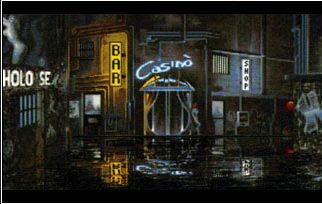 Amongst the references that inspired me there was the gloomy wet world of Blade Runner, which seemed such a beautifully stark contrast with the desert landscapes of Kenshiro. You can imagine my surprise when many years later I’ve discovered that Bladerunner 2049 offered a similar mixture of antithetic scenarios. As an homage to Blade Runner, I proposed the name “Dark Blade“, which we kept for a while. For the music I did manage to write a couple of atmospheric dark tracks, but soon enough I realised that I didn’t have the bandwidth to work on both aspects at the same time. So, we’ve decided to involve Nicola Tomljanovich which was a very active game musician at that time and in my opinion he did an excellent job. In order to progress quickly we also agreed on involving Stefano Aquino once again, with the task of programming the intro based on my stills images. My initial idea was to enrich the action with some adventure, allowing the players to immerse themselves in that universe: talking to other characters at the bar, gambling, and upgrading their gear in between races with the money earned. Emanuele was still figuring out some technical aspects when I came up with a couple of cityscapes as a proof of concept for this part of the game. The more I was thinking about this game the more my ambition grew and I now realise that I was slipping into the trap of designing a “Mega-game” (games that destroy companies because too vast and expensive to be realised). However, the hard truth was that we were just a bunch of teenagers working in their bedrooms, with no funding, no publisher, in a country where there was no real industry and most importantly no one of us could speak English at a decent level! At that time I felt the other guys could communicate well enough, but I now realise how much the language constituted a massive obstacle for finding an international business partner. In fact, my not so secret hope was to do what Reflections, Art and Magic and other developer teams had done before: craft an amazing demo and knock at Psygnosis door, hoping to find a partner in them. After a few months of work (it must have been late 1993 or perhaps early 1994) we had a playable demo with most levels, a decent intro and some nice audio tracks. We tried to get in touch with a few publisher, but only Krisalis replied with interest, although this evaporated after just a couple of FAX message exchanges. Obviously we were completely unaware but the world of gaming was about to be revolutionised by the upcoming Playstation and 2D games were destined to quickly go out of fashion (for quite a while at least), Commodore and Amiga were in their death row and our hard work was becoming obsolete by the minute. We were experiencing the quiet before the perfect storm and it was very difficult for me to understand or accept how things were panning out. My partners in this adventure seemed a bit more healthy and rational about what was going on and they decided to somehow limit the damage, freezing the development of the game. So a bit more was done to it, but not a huge amount and the adventure part of the game between races never saw the light of the day. Luckily by the end of 1994 we’ve got in touch with Lightshock Software a group of Italian developers that wanted to somehow escape the depressing landscape we were all stuck in. They were young ambitious dreamers, very passionate about video games -as we were- and they had a nice positive energy which allowed them to quickly gather under their newly formed label a few groups of people from all over the country, each one with their own project in progress. After a few meetings we decided to join forces and we planned on finishing the game, which was then renamed “Black Viper”. By that time it was clear that the future of the gaming market was in the consoles and we had to make a Commodore CD32 version of our game. That allowed and somehow required to fill the data space available on a CD and it felt a great opportunity to render some 3D CGI. For this task we involved Alberto Gelpi, a childhood friend of mine, a couple of years younger than me. Until then he had followed my 2D endeavours on Amiga with a certain curiosity and these inspired him to go further and do some interesting experiments with “Imagine”, a 3D software for PC. We teamed up and whilst he was modelling on a PC, I was producing textures on his Amiga 1200. Then he assembled everything staging the action, setting the lights and designing the camera movements. Today Alberto is an accomplished director and this was his very first experience with film making. In fact, in the end he rendered several minutes of CGI…all done on his Pentium 75! I was very lucky to witness this from such a close distance and I quickly realised that I had to evolve and learn more about CGI. More content required a stronger story. So, the team decided to also involve Emanuele Scichilone, another talented friend which also took care of the manual of the game. Marco Biondi, Massimiliano Calamai and Francesco Iorio, provided important feedback and technical support, but things moved slowly and the game only came out in 1996 when Commodore filed Bankruptcy and the world of gaming was no longer interested in an Amiga 500 racing title. We were three years late! In fact the game sold only a few copies and it collected a few really bad reviews. Some of them were harsh to a point that made me realise the journalist’s anger and frustration at the whole Commodore situation rather than them being just an analysis of our title merits and faults, or perhaps there was some confusion about the fact that most of the game had been made in 1993 and hence it was designed to run on the old Amiga 500 (it was only expanded for CD32 through the extra full motion videos). Yes, the game is very hard, but that was the case for many games of that generation. (try to play the first or second Shadow of the Beast without cheat mode!). To my surprise, I’ve recently realised that some people have rediscovered this title and they are appreciating some of its aspects. This long and sometimes painful adventure thought me many lessons and gave me the opportunity to consolidate or build good friendships. In fact I’m still using nowadays many of the things and values that I’ve learned back then. 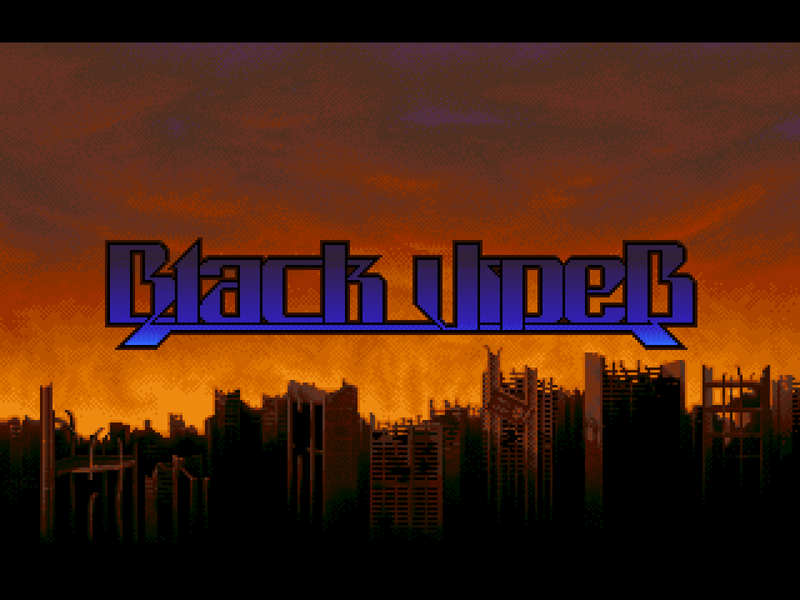 Black Viper // Amiga screenshots. As Commodore shut down, Amiga died and Black Viper made very little money, we all had to figure out where to invest our energies and what to do next. Light Shock didn’t have the financial gravitas to survive the advent of the super expensive 3D games and by then it was clear that we couldn’t manage to revolutionise the Italian market. So, when Luxottica, the world’s largest company in the eyewear industry, approached us to build their game startup company (ProGraph Research), most people from the Light Shock team accepted the offer and moved there. However, we were so disappointed with how things went with Black Viper that no one from our core team wanted to carry on with the game industry. Emanuele Viola focused on academic studies and after graduating with top score in Italy he moved to the United States, where he is Associate Professor at the College of Computer and Information Science Northeastern University, researching and teaching Complexity Theory and Cryptography. Stefano Aquino also decided to focus on his academic studies and he is now project manager for an Italian software company. Alberto Gelpi is shooting real films now. I’ve also aimed at the film industry, perhaps inspired by the enlightening experience I had working with Alberto on Black Viper. As a result, we started collaborating more closely and I started studying 3D myself, with the first NewTek Lightwave ported on PC. A few years later Alberto and I founded ‘Dreamlike Visions’ a post production company with the initial “modest” aim to make kick a** visual effects, soundtracks and more. The company staid open for 8 years and became a crucial stepping stone for our next professional chapters.